The first Escape Fitness FunXtion Interactive Platform installed in the United States is debuting with the opening of The Cliffs at Mountain Park Wellness Center, making functional training safe, effective, accessible and motivational for exercisers of all skill levels. Making use of technology, intelligence and gamification through a touch-screen interactive station, app, website and wristband, FunXtion lets members customize their own workouts via a virtual trainer, learn any fitness movement and record their performance, plus get the full overview of the exercise activities. A hybrid of a treadmill and elliptical, the innovative ZR8000 replicates real running motion but without any stressful impact. With independent hip and knee joints, the ZR8000 offers customized freedom of movement that mimics human biomechanics, so exercisers can walk with a shorter stride or increase speed to run with strides up to 58 inches. The Zero Runner is whisper-quiet and has no belt, deck or cord, thereby minimizing maintenance needs. The Concept2 SkiErg offers a full-body workout based on Nordic skiing motions. Using the same mechanics and electronic monitoring systems as the Concept2 Indoor Rower, the SkiErg builds strength and endurance by working the entire body in efficient, rhythmic motions. Each pull starts with arms and shoulders, involves the core muscles in a downward "crunch" and finished by engaging the legs. Immediate feedback is available via the PM5 performance monitor. The TRUE Alpine Runner is the ultimate in incline training with an incline range of -3 percent to 30 percent. This range intensifies workouts with a variety of programmed workouts, including TRUE's Monument Workouts. Monument Workouts allow the user to climb the heights of internationally famous landmarks like the St. Louis Arch, Eiffel Tower, Mount Everest and more. These features are combined with a patent-pending incline system. 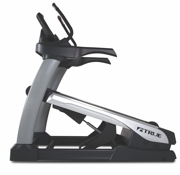 Introducing the Precor® EFX with Converging CrossRamp®. The patented Converging CrossRamp allows exercisers to isolate specific muscle groups by adjusting the angle of the ramp. The redesigned ramp features a new converging foot path that replicates natural movement. Know at a glance when to clean or service your EFX with the Active Status Light™. For easier and faster cleaning, the EFX includes a covered ramp, enclosed rear cover and covered frame. The Tidalwave aquatic exercise bike offers a unique flywheel and folding frame design. Multiple resistance levels, adjustable seat and handlebars allow users of all types to exercise at comfortable settings. The optional semi-recumbent seat provides backrest and seat handles add support and security, an excellent rehabilitation tool. The Tidalwave provides users a fun and effective water workout. Great for low-impact physical therapy, aquatic spin classes and more. 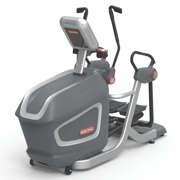 The new VersaStrider is designed to create the ultimate user-centric elliptical training experience. MyStride™ technology allows user to stride at the length they want, when they want. No buttons to press, no levers to pull. Simply get on and stride at the speed and length you desire. VersaStrider will follow your lead. MyStride lets you find your stride. Paired with the unparalleled connectivity and customization of OpenHub cardio consoles, the VersaStrider is one machine that truly feels like a custom fit for every user. Technogym's SKILLMILL is the first non-motorized product that combines power, speed, stamina and agility training. SKILLMILL is the ideal training solution for sports professionals and for those "everyday" athletes who are dedicated to their fitness and improving their sporting performance. The MULTIDRIVE technology (patent pending) enables users to select different levels of reactive resistance, from zero to max. A simple gear-shift switches the workout quickly from resistance-free running to an all-out sled push.